Wi-Fi AC1900 routers: Are they worth it? Why not just get an AC1750 one? In previous reviews, we talked about the latest routers from ASUS and NETGEAR with Wi-Fi AC1900. The main difference between these and the AC1750 is that we can get speeds of up to 600Mbps in the 2.4GHz band thanks to the TurboQAM technology available –as of now- only in Broadcom interfaces. There’s a small issue, however: you can only get these speeds with compatible devices, and those aren’t exactly everywhere. The current Wi-Fi AC1750 cannot be updated to AC1900 via firmware since the hardware won’t support it. The new AC1900 use Broadcom BCM4360 with 3-stream 802.11ac for both 5GHz and 2.4GHz bands. The AC1750 routers use 802.11N chipsets for the 2.4GHz band and 802.11ac for the 5GHz one. Although the main feature of the TurboQAM is its 256-QAM modulation, updates through firmware won’t be possible. The 600Mbps limitation has been set by the maximum bandwidth of the 2.4GHz band: 40MHz, and not 80MHz (or more) like the 5GHz band. NETGEAR has released their latest Wi-Fi AC router, the NETGEAR R7000 Nighthawk. This AC1900 router features simultaneous double band with speeds of up to 600Mbps in the 2.4GHz band and up to 1300Mbps in the 5GHz one thanks to its Wi-Fi AC technology. The main feature of this router is its support for Broadcom’s TurboQAM technology, capable of reaching speeds of up to 600Mbps in the 2.4GHz with three data streams. However, you can only get 600Mbps in the 2.4GHz band if you use a Broadcom chipset compatible with the aforementioned TurboQAM technology. To get offer the highest possible wireless speeds, it features Beamforming+ to focus the signal into a single point. It has three external antennas (RP-SMA), all of them removable. Routers and network-related products are going through a golden age, even with the difficult times we live in. Manufacturers like TP-Link keep innovating with products like the one we’ll review today, a small and portable router capable of setting up a wireless network almost anywhere. The new TP-Link TL-WR710N is a small and light device (85 x 75 x 28 millimeters) that can fit anywhere, designed to work simply by connecting it to a power outlet. It can work as a router thanks to its Ethernet ports, but it’s also an excellent Wi-Fi repeater, can be used with a smart TV or game console and can also work as an access point. With its USB 2.0 port, you can connect to it all kinds of USB drives to share your files with any computer connected to the network. It can also work as a very useful charger for mobile devices; it supports the Wi-Fi 802.11 b/g/n standard, works with the 2.4 GHz band and offers a maximum speed of 150 Mbps. Along with the ASUS RT-AC68U, this is nowadays the fastest modem on the market thanks to the dual band connections. The market of Wi-Fi routers is changing quickly, the 802.11 n standard is slowly becoming a thing of the past with its maximum speeds of 600 Mbps, while the 802.11 ac standard, capable of reaching 1300 Mbps, is present in more devices each day, including the ASUS RT-AC68U and the NETGEAR NightHawk AC1900, routers that combine both technologies and use both the 2.4 GHz (for 802.11 n) and the 5 GHz (for 802.11 ac) bands simultaneously, offering speeds of up to 1900 Mbps. Netgear’s newest model features three antennas to offer the widest range as of now and thanks to its dual-core 1 GHz processor it’s capable of managing networks in both standards simultaneously. It also features data transfer through DLNA, USB 3.0 connectivity and even functions of a NAS since you can connect to it any USB storage device, create FTP servers and also VPN networks. It has one Ethernet port for the WAN and four of them for the LAN, all of them Gigabit. The Netgear Nighthawk AC1900 is available now for 200 USD. 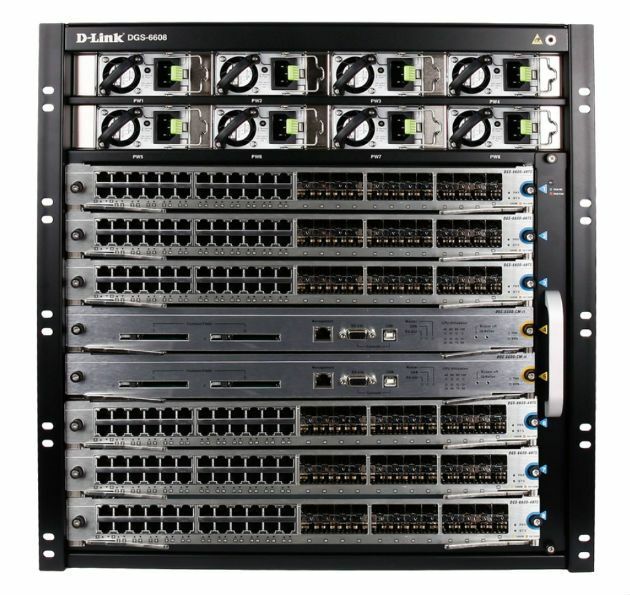 D-Link has released the DGS-6608, a case with eight slots and double controller, Hot Swap cooling system and redundant power supply from Terabit. This router is capable of reaching speeds of up to 1900 Mbps in the 802.11ac and 802.11n standards. If we combine the speed of the 802.11ac standard in the 5 GHz band, 1300 Mbps, with the 802.11 n standards in the 2.4 GHz band –up to 600 Mbps-, we get a whopping 1900 Mbps. This is what ASUS said with the release of the RT-AC68U, a router capable of combining the speeds of two different bands. It has 5 Gigabit Ethernet ports and one USB 3.0 and one USB 2.0 ports to connect storage devices and convert the router into a small NAS. Thanks to the many technologies of the company, it can be turned into a multimedia center or NAS. It features DLNA support, can open and share photos, audio and video, has BitTorrent and ED2K clients, FTP server and a very complete network managing and monitoring system. It’s available for pre-order and for 219 Dollars and it will officially hit the market on October 9. AVM has presented at Berlin’s IFA their latest wireless devices. The German company knows the needs of their consumers and has released the best possible Wi-Fi devices. These new models are the FRITZ!WLAN Repeater 450E, a Wi-Fi repeater to increase the range of the signal, and the FRITZ! WLAN Stick AC430, a Wi-Fi AC adapter, AVM’s first Wi-Fi AC device. The new FRITZ!WLAN Repeater 450E is a universal Wifi repeater to increase the range of our signal quickly and easily: all you have to do is press the WPS button to synchronize the device with your router. It features one Gigabit Ethernet port for the LAN, so you can also connect one device via a wired connection to get the best possible speeds. You can get wireless speed of up to 450Mbps in the 2.4GHz band thanks to the Three-Stream technology and its three MIMO 3T3R internal antennas. The new FRITZ!WLAN Stick AC430 is AVM’s latest Wi-Fi adapter, the first Wi-Fi AC device from the company, a feature that we will surely see in their next high-end devices. This adapter can reach speeds of up to 433 Mbps in the 5GHz band with Wifi AC, and if we use this adapter with Wi-Fi N devices we can get speeds of up to 150 Mbps in 2.4GHz and 5GHz. Posted in: News, Wireless Router Review / Tagged: FRITZ! AVM has presented the new FRITZ!Box 7490, a high-end router that will replace the FRITZ!Box 7390, which offered great results during our tests. This router is compatible with ADSL and VDSL lines thanks to its integrated modem and you can also use it as a neutral router by configuring its LAN1 and Internet WAN. It is also compatible with the 802.1q VLAN Tagging protocol, especially useful for optic fiber connections. The design of the FRITZ!Box 7490 is very similar to previous models: it’s available in red and it’s compatible with pretty much any network and standard. 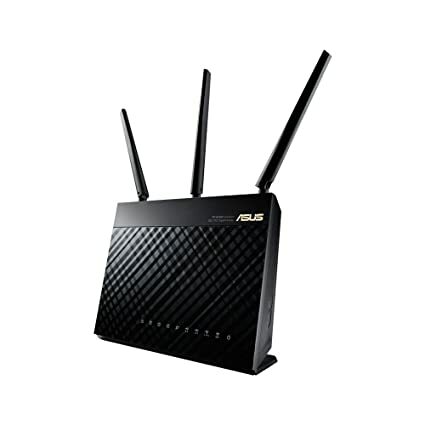 ASUS presents their new routers at the Computex 2013; both feature the latest Wi-Fi technology, the 802.11ac standard, which offers amazing speeds in the 5GHz band, and depending on the antennas, it can reach speeds 2 to 5 times faster than the old 802.11N standard. The models they presented were the ASUS RT-AC56U and the ASUS RT-AC68U, which we will now review in detail. This new dual-band router can reach speeds of up to 300Mbps in the 2.4GHz band and 867Mbps in the 5GHz one using the 802.11ac standard. It has two MIMO 2T2R internal antennas for each band. This router can be classified as an AC1200, if you don’t know what that means, we recommend you to read this: Router manufacturers classifications.